Is humanity’s fate set in stone? Has The Expanse TV show been cancelled or renewed for a fourth season on Syfy? The television vulture is watching all the latest cancellation and renewal news, so this page is the place to track the status of The Expanse, season four. Bookmark it, or subscribe for the latest updates. Remember, the television vulture is watching your shows. Are you? A Syfy drama, based on the science-fiction novels by James S. A. Corey (i.e. the pen name for authors Daniel Abraham and Ty Franck), The Expanse stars Steven Strait, Shohreh Aghdashloo, Dominique Tipper, Cas Anvar, Wes Chatham, and Frankie Adams. The story unfolds 200 years in the future, in a colonized galaxy, when two strangers are caught up in a vast conspiracy. Season three kicks off immediately after the events of the second season finale, with Earth, Mars, and The Belt at war. The quest to discover the secret of the protomolecule intensifies and every decision made risks the survival of the solar system. The third season of The Expanse averaged a 0.18 rating in the 18-49 demographic and 606,000 viewers. Compared to season two, that’s down by 3% in the demo and up by 8% in viewers. Find out how The Expanse stacks up against the other Syfy TV shows. Although Syfy cancelled it, Amazon has saved The Expanse and ordered the fourth season, with a start date TBD. Stay tuned for further updates. 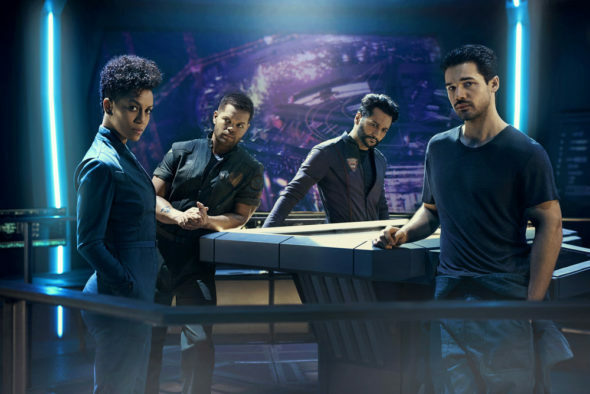 Although it premiered with decent numbers for basic cable, it is still too early to use those ratings to predict whether Syfy will cancel or renew The Expanse for season four. Flying blind, I think it will score a renewal, but let’s see what happens as more ratings data rolls in. For now, I’ll keep an eye on the Nielsens and update this page with breaking developments. Subscribe for free cancellation and renewal alerts for The Expanse. 5/26/2018 Status Update: Amazon has picked up the fourth season of The Expanse. Details here. 5/11/2018 Status Update: Despite ratings stability, The Expanse has been cancelled by Syfy, but there’s still hope for season four. Details here. Find more of The Expanse TV series news or other Syfy TV show news. What do you think? Should Syfy have cancelled or renewed The Expanse for season four? Will you follow this TV series to Amazon? The stealth fighters were owned by Mao and served at his will, but he was arrested, wasn’t he? In any case, everyone is onto him now and would know who was causing havoc with the stealth fighters should he chose to do that. Well, it’s a network that really doesn’t care about ratings. but more about what people want not caring bad in the demographics. Amazon wouldn’t care. Because they don’t care about ratings they just care about what a fraction of what the watch population wants. Money is no object for this company. Also, the show is apparently a personal favorite of Jeff Bezos, so it seems as if the show will have a long future!